OneClickDrive.com OneClickDrive.com presents a comprehensive set of frequently asked questions that you might need answers for before renting a car in the UAE. No matter if you decide to rent a Kia Picanto, Cadillac Escalade or even a Ferrari 488 in the emirates, the below answers apply. Source: various car rental companies operating in Dubai, Abu Dhabi, Ras Al Khaimah and RTA (Road and Transport Authority) itself. Please feel free to share your suggestions and comments with us. What documents are required to rent a car in Dubai, UAE? 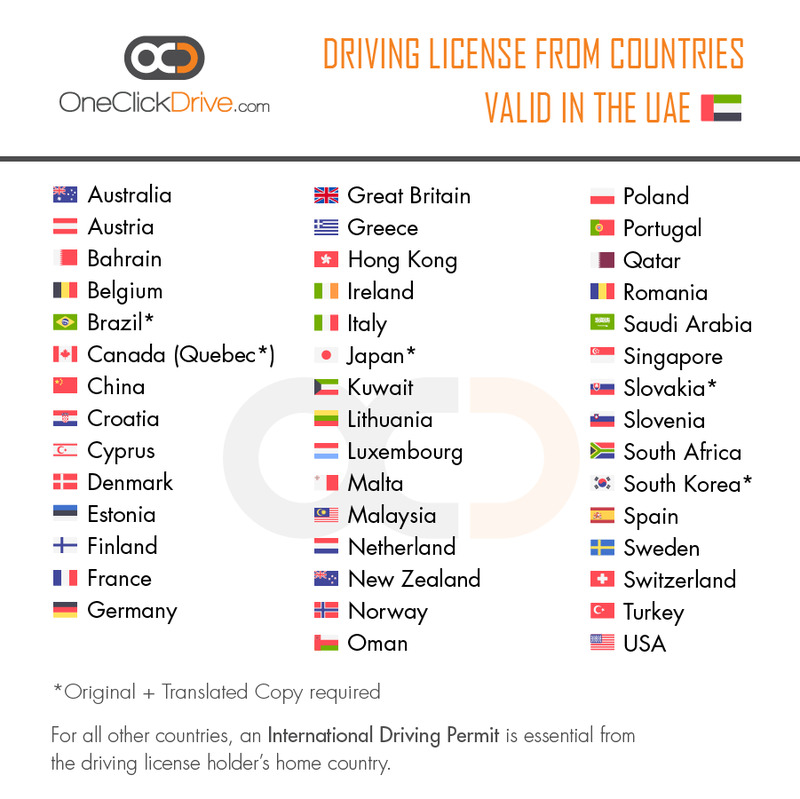 Find out if your country's driving license is valid in the UAE here. Which countries’ driving licenses are valid in the UAE? There are no overheads unless otherwise specified by the car hire company. You only need to pay the full rental amount for the period you need the car as a daily / weekly / monthly deal. However, a refundable deposit amount of AED 1500 or more per car is blocked by the car hire agency. Some companies accept the deposit amount in cash too. It’s best to ask regarding the type of insurance the rental cost includes as some companies provide no car insurance at all. And it will have to be considered as an additional cost. Why do rental car companies block the deposit amount on your credit card? Since traffic fines sometimes generate several days after the incident is recorded / reported by the RTA, companies block the deposit amount on a credit card as a safety net for fines incurred on their leased cars while they were rented by you. This also helps in times when a rental car is damaged by the driver. Incase there are no fines or deductibles, the blocked amount is released within 14-20 days. On request, you can settle the additional charges in cash too if you do not wish to use your credit card. Salik is Dubai's electronic toll collection system. There are no toll booths in Dubai providing you a continuous drive across the UAE without any interruptions. When you cross a Salik, charges are also recorded by the rental company through the RTA Salik system. You, the car renter / driver, pays the Salik charges. Car hire companies mark up the cost to AED 5 per salik. Here is a complete list of Salik Toll Booths in Dubai. In the UAE, all rental cars come with an air-conditioner (AC) and FM radio. Most rental cars (newer models especially) come with a USB music player / mobile charging port so don't forget to carry your USB data cable for your mobile phones. Chargeable extras such as GPS, Baby or Child Seats, WiFi may also available on request from the car rent shops. Are insurance charges part of the car rental price? In Dubai, most car rental companies offer standard insurance inclusive of the car rental price. However, always confirm the included insurance with the car hire company’s staff. If you're getting a car well below the market rate, there might not be any insurance included. CDW insurance is Collision Damage Waiver which means that you are covered if there are any accidental damages to the car in a collision, no matter who is at fault. However, it is essential to get a Police Report (whichever emirate you are in). Consider getting CDW insurance if your rental car comes with a standard insurance package. Comprehensive insurance covers you incase of any accidental damage to the vehicle, provided it isn’t your fault. A police report proving the same with a green or white slip must be produced for the same. Comprehensive insurance is generally included within the rental price as per RTA regulations in the UAE. However, we have heard that some car rental companies charge additional as "insurance cost". Be vary of such companies as they might incur other hidden charges. All car rental offers in the UAE on OneClickDrive.com include comprehensive insurance. This is the best form of rental car insurance in the UAE. Full coverage insurance protects you from incurring collision and other damage charges you might incur in an accident, no matter who is at fault. Only a few big players in the UAE offer this type of insurance. They generally charge an additional fee to the customer between AED 250 - AED 750 depending on the car and rental period. Can anyone else drive my hired car other than me? No, only the registered driver whose driving license and details have been submitted can drive a leased car. If the car rented by you meets with an accident and the person in the driving seat is not you, the Police might consider you at fault even though it isn't your fault besides incurring other fines. An additional driver can be registered on the same hired car by submitting the required documents: copy of valid UAE driving license and visa alongwith AED 200 or so as registration fee. In a city, where there are more than 500 car rental companies. It's unadvisable to settle with the first car rental offered to you in Dubai. Not only will you end up with a bad deal but you might just be liable to pay additional charges, should you not do your research right. What is mileage limitation? Why should I care about it? Mileage limitation is the number of kilometers you can drive your rental car free of cost. The mileage limitation (200 km, 300 km or so) is provided as part of the rental price. Some car rental companies offer unlimited mileage with which you can drive the rental car for any amount of distance / kilometers free of cost. You should care to check the car rental mileage limitation as the car rental price you are paying might be a bad deal if the mileage limitation is too less even if the car hire charge is low. What about fuel charges? Who pays for the petrol (gas) in a rental car? You, the car renter / driver, pay for the fuel expenses. The fuel costs in the United Arab Emirates are quite low anyway so fuel costs should not be much of a worry. However, if you are planning to drive large distances on a regular basis, find out the mileage your car delivers per litre / gallon to be sure. The fuel stations are rather crowded during peak hours, especially the petrol station by Tecom Metro Station off Sheikh Zayed Road. What type of fuel should I fill in the car I have leased? Always check / note the type of fuel you must refill in the car you are hiring, right at the start. You can reach the car rental staff and check with them by mentioning the car you're driving and the rental reference no. While staff at the fuel stations / petrol pumps can assist you with this, it is your responsibility to fuel the rental car with the right type of gas. In the event of fueling the car with the wrong fuel type, you might be liable to pay for the damage done to the car including the cost of repairs and days it is kept in the garage. Some car rental companies are known to charge extremely high charges including repair costs + days the car is kept in the garage for repairs + admin fees (up to AED 1000) even for minor dents. Be sure to understand the terms if you're planning for a long-term lease from the car lease company staff. Concealing that small dent might seem like a good idea but if you're caught, the result might be even more expensive. Always keep your eyes open and note the existing dents, scratches and so on when the car rental staff checks the car before handing you the keys. Take pictures on your smartphone if necessary. Who pays for parking a rented car? The customer pays for the parking at the parking machines located within/nearby parking lots. How do I pay for parking my hired vehicle in Dubai, UAE? RTA provides multiple payment methods for parking in its public parking zones with the UAE. Firstly, you can pay directly in cash at the Park Meters located within / nearby parking lots. After you pay by coins or notes, a parking ticket will be issued and drop into the glass box below. It'd a good practice to place the parking ticket on the front dashboard inside the car for the RTA police's convenience. Every hour cost 2 AED in Dubai, put 2-Dirham in the slot and press OK. You should put receipt under the glass.By sms, from your mobile phone send sms to 7275 with text “Plate number number of area and the number of hours you require the space.”. What are the parking charges in Dubai? The charges are AED 2 per hour so you can pay based on the amount of time you need to park in the designated zone. On Fridays, it’s free to park in public parking lots maintained by RTA Dubai. However, it's best to refer to the information on the orange and white parking meters to know the rules, timings and other details. Here's a complete list of traffic fines and charges by RTA Dubai . The above FAQs are written for those interested in hiring a car in Dubai and are gathered from various sources including our partner car rental companies. However, please ask / confirm the details with the car rental company you deal with or Dubai Road & Transport Authority (RTA) authorities for accurate answers. We will be updating this section on an ongoing basis. If you would like to suggest any additions or corrections to this section, please feel free to email us on info@oneclickdrive.com. OneClickDrive claims no responsibility regarding the authenticity and applicability of the above questions & answers and any loss that you may incur by referring to the above information.